At 184 metres tall, Seattle’s Space Needle is one of the globe’s most iconic structures. Thanks to its unique shape, the city’s skyline is internationally recognised by most people − second only to Paris with the Eiffel Tower. Built for the 1962 World’s Fair, the Space Needle was designed to illustrate “the age of space” and has since stood as a symbol of mankind’s space-age aspirations. As well as this iconography, the Space Needle also delivers breath-taking views of the city and the surrounding area, with its 158.5 metre tall saucer-shaped “top house” offering visitors 360-degree indoor and outdoor panoramic views of the city, Mount Rainier, Puget Sound and the Cascades and Olympic mountain ranges. 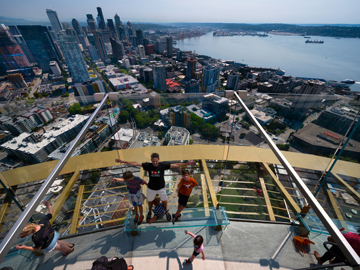 Due to these experiences, the Space Needle is an incredibly popular attraction, which is only set to get even better thanks to a recent venture focused on its preservation and renovation − a lot of which has included the deployment of the SentryGlas® Ionoplast interlayer from Trosifol™. “The brief,” according to Richard Green, from consulting glazing engineers Front Inc., “was based around the question of how to keep this monumental tower relevant for the next 50 years. Following the creation of some initial ideas by design principal Alan Maskin and project architect Blair Payson of Seattle-based design firm Olson Kundig, significant research and surveys were undertaken to marry the two concepts of structural feasibility and what the public wanted to see. The renovation includes large amounts of structural glazing, incorporating SentryGlas®, which has been included to foster the Needle’s original design intent − to deliver unobstructed views of the surrounding area. 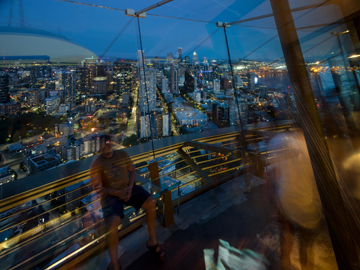 New features include multilevel viewing experiences through floor-to-ceiling glass, including new 3.35 metre high slanted, open-air glass walls and glass benches on the outdoor observation deck. 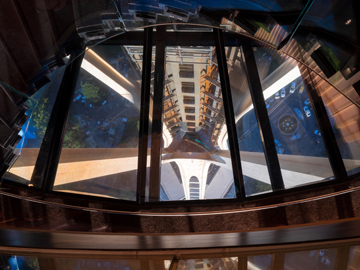 Two steel and glass staircases with radiating wood panelling − called the Oculus Stairs − connect this upper-level to The Loupe level below − which contains the world’s first and only rotating glass floor − giving never-before-seen downward views of the tower’s support legs. The glass-panel formulations used in the construction are almost as impressive as the tower itself. 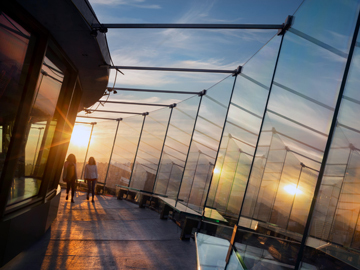 The angled observation deck barrier comprises three 15 mm panes of ultra-clear low-iron glass, sandwiching two 2.28 mm SentryGlas® interlayers. The Loupe glass floor is probably the most impressive. From the bottom upwards it uses two 6 mm low-iron glass panes on either side of a 1.52 mm SentryGlas® interlayer. A 20 mm Argon gap separates this laminated panel from another, which has three 10 mm glass panels sandwiching two 2.28 mm SentryGlas® interlayers. Completing this panel is a 0.2 mm clear safety film and a 6 mm glass pane. In keeping with the Needle’s original appearance, a soffit has also been installed on the underside, with a grey frit on surface one in order to mimic the original colour of the materials used in the construction. This soffit comprises two laminated panels separated by a 16 mm Argon gap. Both panels are made up of two panes of 6 mm non tinted low-iron glass sandwiching a 2.28 mm SentryGlas® interlayer. 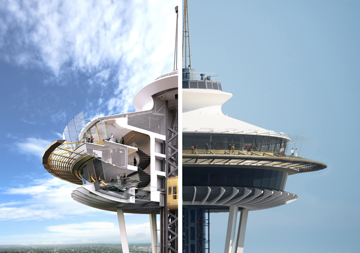 “The observation deck barrier is the most immediately impressive construction,” Green said. “It is made up of very big chunks of glass. You can see edges and perceive its size, but after a while it totally disappears − adding to the thrill of the view. We undertook extensive and very demanding testing for these panels, including fracturing all three plies and testing to their proof load. 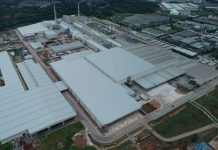 They were designed using the same principles as reinforced concrete, with the SentryGlas® interlayer delivering the necessary strength in the highly unlikely event of all three plies being broken. With support only along one edge and at two corners, this testing was vital, especially considering they lean out at a 14.5-degree angle. Anything more than this and they would have been classed as overhanging. The SentryGlas® also addressed the problem of creep. With 3 metre high glass panels only supported on two sides, standard PVB was not an option for creep resistance. “This project is a reflection of glass and interlayer performance,” Payson explained. “The original designers wanted to use more glass, but at that time the technology was simply not available. The original 1961 model exhibited larger glass panels, but glass in the ‘60s did not offer the necessary wind-load capacity − this was further hindered by a glass shortage and budget restrictions − so they went as far as they could.